I'm sick of my house plants, especially now that they're all brown and don't answer when I talk to them any more. Where can I get myself a big sack of tentacles? A big, beautiful sack brimming and bulging with tentacles? The answer is, as is so often the case, the Indo-Pacific. Magnificent Sea Anemones can be found in tropical waters from east Africa all the way to southern Japan and northern Australia. Magnificent Sea Anemones are not only magnificent for their large size and bright colours, they're also gregarious and sociable! While they can be found in shallow, sunny waters, the biggest ones live in gloomier depths of 20 metres (60 feet), occasionally more. Down here they must rely on their tentacles to fill their bellies with delicious fish and shrimp. I guess it helps to be big when you need to hunt for your food, so they grow to 50 cm (20 in) across and sometimes twice that! Each tentacle can reach over 8 cm (3 in) long, more than enough to deal with a variety of prey. 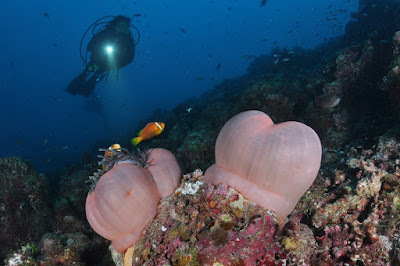 To top it off, these gigantic sea anemones like to hang out in big groups on rocky ground. It's a deadly field of Magnificent, venomous tentacles. 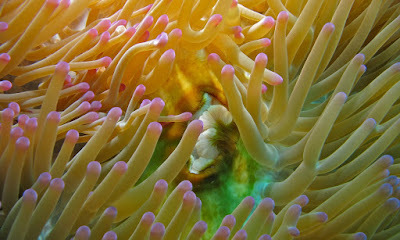 Magnificent Sea Anemones in shallow water are quite different from their deeper counter-parts. They tend to be more solitary and can be as small as 20 cm (8 in) across. They're still friendly, though. When they're not stinging stuff with their tentacles, I mean. Like lots of other sea anemones, the Magnificent variety is packed full of friendly micro-organisms known as zooxanthellae. 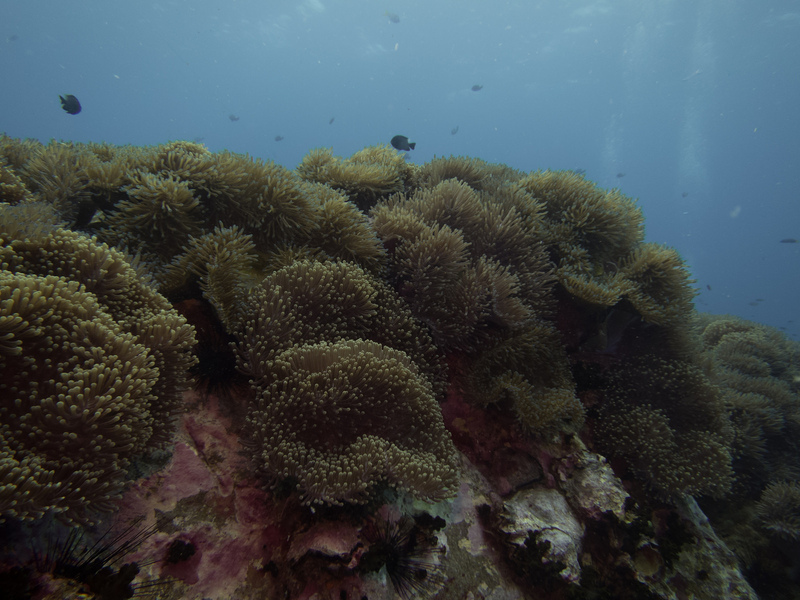 In shallow waters these zooxanthellae can get lots of sun to power their photosynthesis. 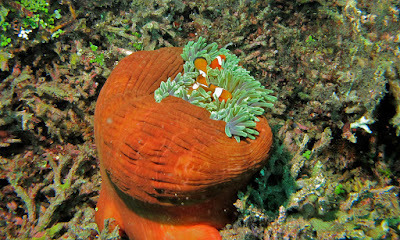 And, as it turns out, the waste products of photosynthesis are good eating for a sea anemone. But it doesn't end there. 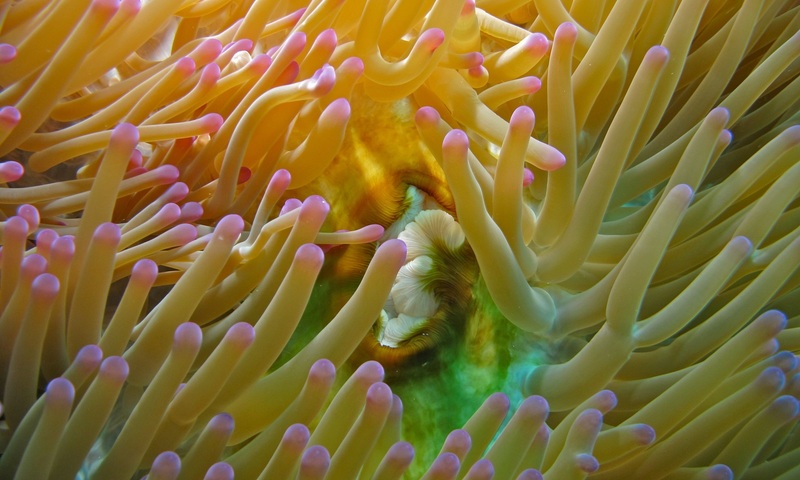 Magnificent Sea Anemones are real pillars of the community. Or tentacle-sacks of the community, to be more precise. 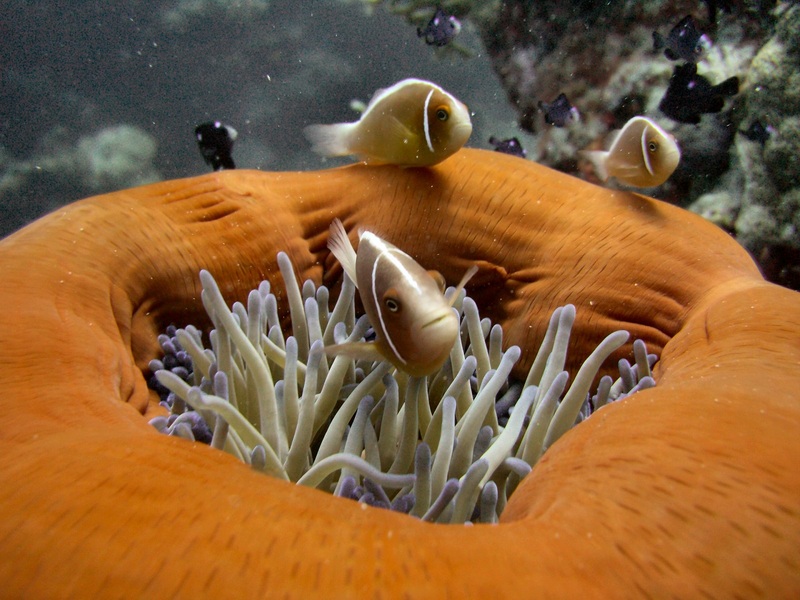 Clownfish, also known as Anemonefish, are covered in a slime that allows them to touch a sea anemone's tentacles without getting stung. So that's what they do. 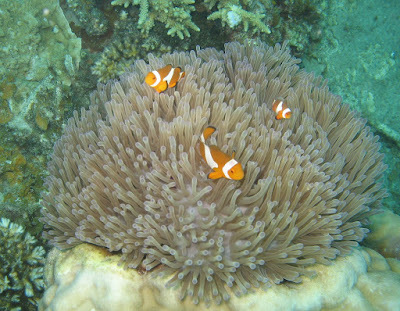 And Magnificent Sea Anemones are a favourite home for many species of Anemonefish. After all, if you're going to live in a tentacle cottage, it may as well be a magnificent one. So the Anemonefish chases away polychaete worms and other pests that might nibble on even the mightiest of sea anemones. 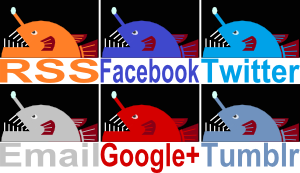 In return, the fish gets a safe place to stay. And, it turns out fish poo is pretty good fertilizer for all that zooxanthelae. Now it's not so much a deadly field as a delightful garden. 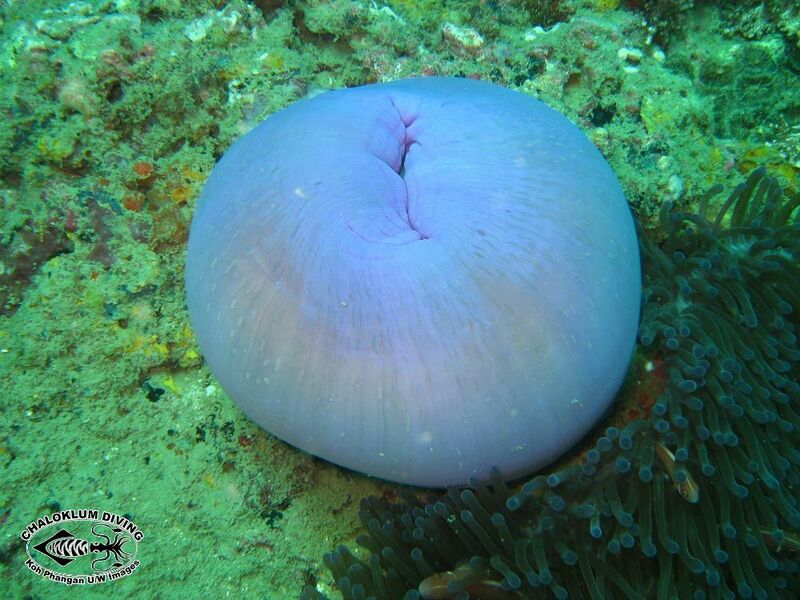 As gregarious as they may be, there are times when a Magnificent Sea Anemone needs time alone to think. Why am I so magnificent? Why is that worm nibbling me? Is being covered in fish poo mostly good or mostly bad? That kind of thing. Luckily, Magnificent Sea Anemones can completely retract all of their tentacles into their base. They end up looking like a big, puckered blob. Catch them from the right angle and they look more like a pair of buttocks! 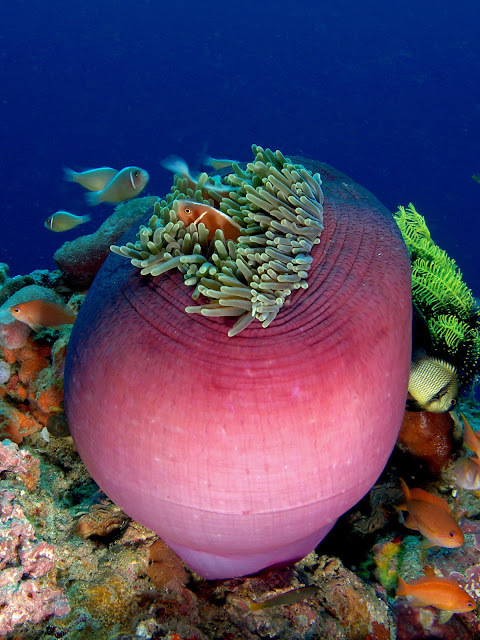 There are many sides to the Magnificent Sea Anemone. And one of them is a backside. Me too! I love a bit of time relaxing in the old mind-blob!